Creationists. Flat-earthers. Conspiracy theorists. Perpetual-motion inventors. The world is full of kooks, crackpots and outright frauds. Some are harmless, some dangerous but all share a common ground in their delusions and Bob Schadewald made it his life’s mission to study, understand and even befriend them. Unlike the unfair caricature of the shrill, antagonistic skeptic with which most non-believers are portrayed these days, Schadewald felt genuine affection for these people, although heaped deserving scorn on many of their ideas. 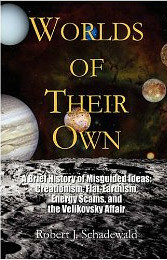 Worlds Of Their Own is a posthumous collection of some of his better-known articles, chronicling his adventures from the last ever interview with Immanuel Velikovsky through his ejection from the Flat Earth society for promotion of heretical, spherical ideologies. The book begins with a look at the holy grail of many scientifically-illiterate engineers – the perpetual motion device. In these times of climate change and looming oil scarcity, the possibility of a device allowing unfettered access to energy from the softest initial push seems more tempting than ever. Through the centuries many have tried and as Schadewald scrupulously documents have succeeded in swindling substantial funding from would-be investors. However, all these attempts were doomed to run afoul of their arch-nemisis, the laws of thermodynamics. Worlds Of Their Own examines several such devices, their histories and the characters of their inventors, before inevitably revealing the hidden power sources which made the impossible possible. Schadewald leaves us in no doubt that physics does not provide free lunches, yet manages to do so without appearing condescending towards those who merely misunderstood the rules of the game. It’s this compassion which makes the compendium such a compelling read rather than just another fish-in-a-barrel frenzy. A substantial portion of the book consists of his decades-long love affair with one of the more bizarre beliefs still current in the world, namely that the earth is flat as opposed to spherical. Zetetic geography dictates that the world is either a disc, with the north pole at the centre and the impassible ice barrier of the Antarctic protecting the rim, or a rectangle akin to a classic Mercator projection with the stars draped over it like a tent. The title ‘Worlds Of Their Own‘ never seems more apt than when applied to this particular branch of pseudoscience. In a treatment spanning several overlapping articles, Schadewald details the varying guises which flat earth theory ha taken over the years and spends some time investigating its biblical roots. It’s a common cry among pseudoscientists and conspiracy theorists alike that “scientists thought the world was flat until a few hundred years ago!” Ahem, history begs to differ. The sphericity of our planet was well-known to the Greeks but this knowledge became buried under the stifling influence of religion until science again began to flourish in the Renaissance.Schadewald’s most personal recollections come to the fore in this section. Recollecting his membership of the Flat Earth Society as a mole he seems full of genuine warmth and affection for the eccentrics with which he was surrounded. At no point does he deliver any withering put-downs or vaunt his stronger grasp of scientific principles or historical research. Instead he simply observes and questions, seeking to understand the inner workings of these belief systems with passion and a strange kind of respect. He is somewhat less generous, I’m happy to say, when it comes to the issue of creationism. He attacks their senseless doctrine with no small amount of ire and recounts in gory detail the insidious transition from Creationism to Intelligent Design. Schadewald’s attitude, much like my own, is that if a belief is harmless then let it be. This is far from the case with creationism and he recognises it, switching clearly into attack mode. He spears the thoroughly biblical roots as well as ridiculing the laughably weak pseduoscientific sheen currently being applied. I could happily have read a book-length treatment of this issue and would love to have heard his take on more recent developments like the Kitzmiller/Dover trial. The highlight for me was his chapter elucidating the differences between science and pseudoscience and particularly the Galileo complex so beloved of cranks (“They didn’t believe Galileo at first either!”). This is illustrated in a case study of Immanuel Velikovsky and Alfred Wegener. Velikovsky proposed, against all evidence, that the earth’s history was profoundly influenced by the erratic actions of a comet ejected by Jupiter which later became the planet Venus. His theory, seeking to explain biblical events such as the sun standing still and the flood, was universally panned, leading to the infamous ‘Velikovsky Affair’. Wegener, on the other hand, upset geological orthodoxy by proposing the theory of continental drift. Despite at the time having no formal grounding in geology his theory, initially rejected outright by the scientific community, was eventually refined and accepted as the best fit for the facts. Why the difference? Schadewald’s understanding of the scientific method and the pseudoscientific mindset really shine through in his explanations. Despite being inevitably a little fragmented, not to mention out of date, Worlds Of Their Own is a wonderful reminder of why it is always important to think. Why we need to keep our guard up against the advances of the anti-rational. Schadewald, like Carl Sagan, is one of those voices we sorely miss in a world bursting at the seams with New Age pseudoscience, religious fundamentalism and conspiracy theories. Would that he were still around to add his weight to the resistance.